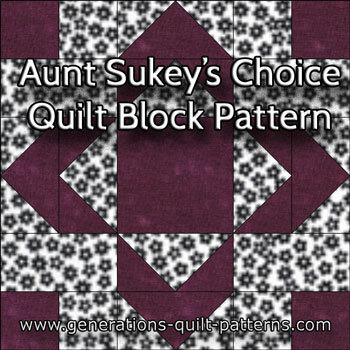 The Aunt Sukey's Choice quilt block is much easier to put together than it looks at first glance. Those little arrow-looking shapes are nothing more than pairs of Flying Geese. 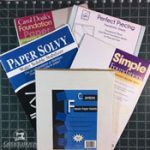 We'll paperpiece those to get really sharp, pointy-points. The corners are simply the start of a corner Log Cabin block. We'll use traditional piecing methods for that. Easy Peasy! 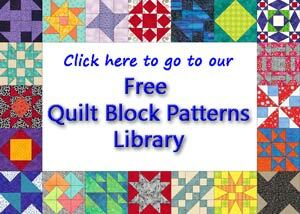 Even if you're a beginning quilter, you CAN make this block! All it takes are two fabrics and you're ready to begin your own Aunt Sukey's Choice. You'll love the results when you try our favorite pressing technique. 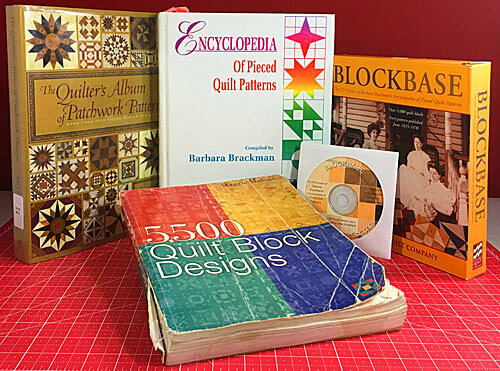 Ultra-flat quilt blocks are achievable with this simple process. No special tools. Fast. Quick. And easy. It doesn't get better than that! 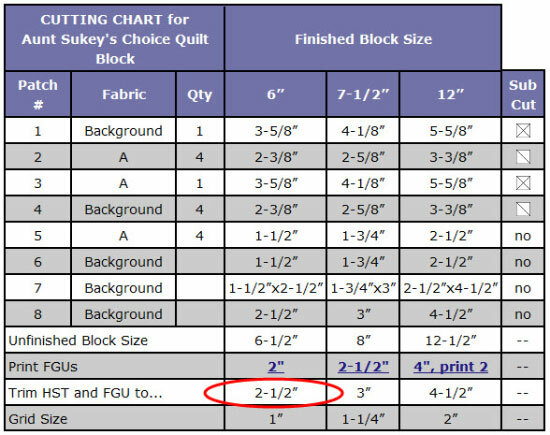 Choose your Block size from the Cutting Chart on this page. 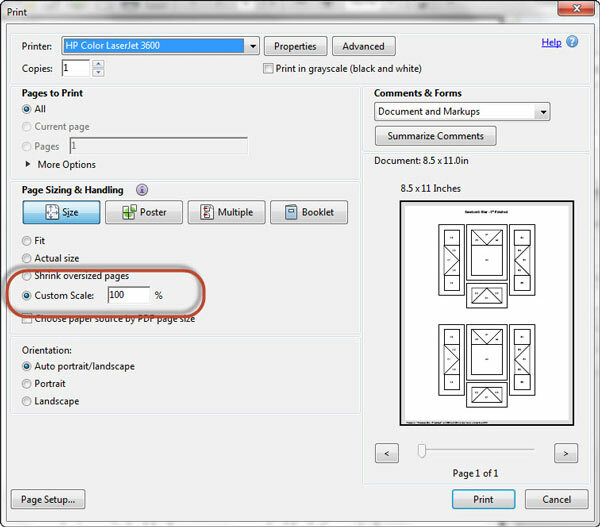 There is a row labeled 'Print FGUs'. 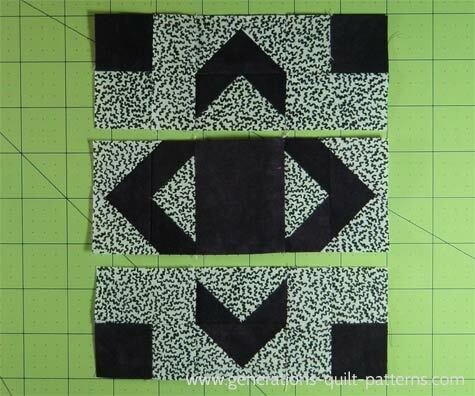 At the intersection of this row and column is the link to the Flying Geese pattern to print that we'll need for our Aunt Sukey's Choice block. 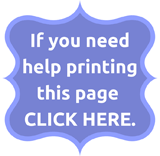 Print 1 copy unless otherwise indicated. 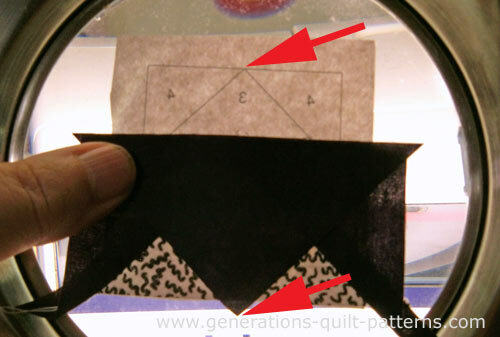 From the same 'Finished Size' column, cut the patches listed in it in the dimensions and fabrics indicated. For well-defined points, you'll want fabrics with good contrast. And finally 'BAC' in the chart below stands for 'Background fabric'. The corners are mirror images of each other. With right sides together (RST) stitch a #5 to a #6. Make 4. Press, SA to the dark. Make two units each with #5 to the left and two with #5 to the right as shown below. With RST, stitch along the long side. Press with SA toward #7 so the seams of this corner patch and the adjacent FGU nest. That makes matching the seams easier. 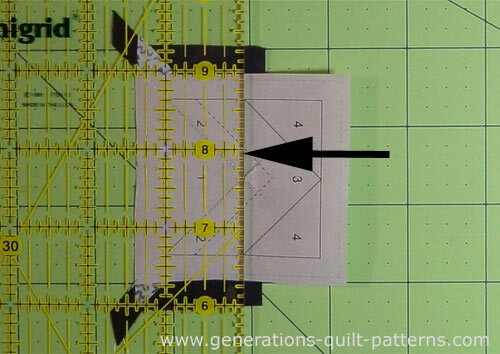 Increase your stitch length to 15-18 stitches/inch. 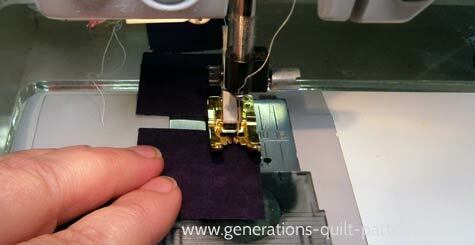 Use an open toe applique foot for the best view of your needle. 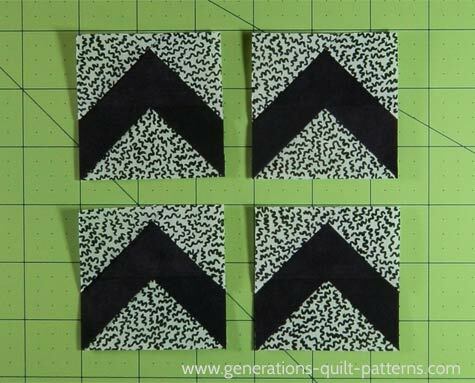 Cut out the four pattern units. Don't bother being neat—a rough cut just past the outside dashed lines will do. 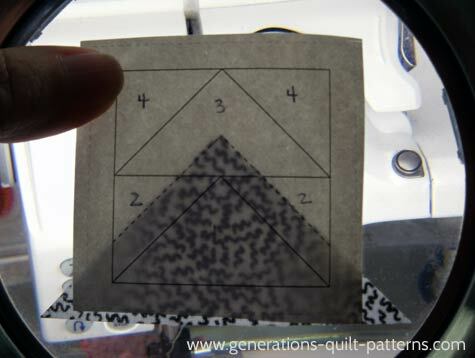 Position the back side of #1 to the unprinted side of the pattern using the dashed guidelines for quick and easy positioning. A dot of Elmer's Washable glue stick does a great job holding this patch in place. With RST, align the long edge of a #2 with #1. Stitch starting before and ending after the line. No need to backstitch. Future stitching crosses and secures these stitches. Press. Repeat for the second #2. To establish the next seamline, lay the unit paper side up on your mat. 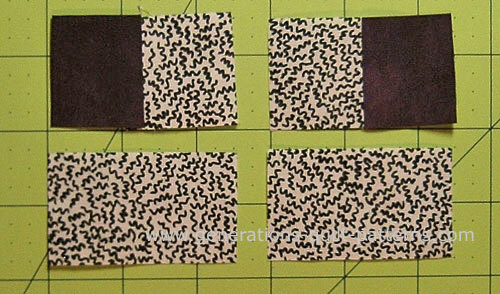 Position your ruler so its edge matches the stitching between #3 and the rest of the block (black arrow). Crease the paper along the ruler and fold it back on itself. 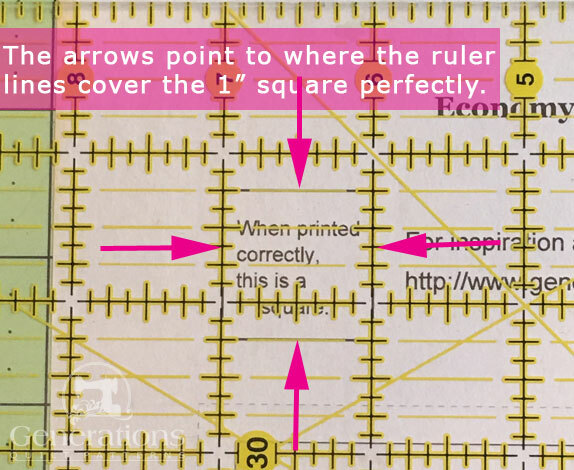 Reposition the ruler so the 1/4" mark lines up with the folded edge (black arrow). 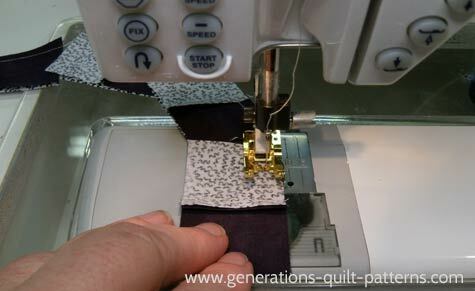 Cut off the excess fabric with your cutter. With RST align the edges of a #3 with the cut edge. For accurate positioning, the point of #3 patch (bottom arrow) should be directly below the backwards #3 point on the pattern. The numbers are backwards in this photo because we add fabric to the unprinted side. Stitch on the line, starting and stopping past the dashed lines. Press. Add the #4 patches. Trim the FGUs to size. 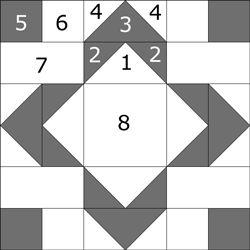 This number is found at the intersection of 'Trim HST and FGU to...' row and the 'Finished Block Size' column. 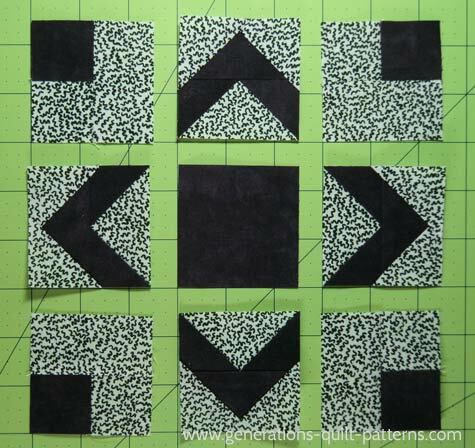 For our 6" finished Aunt Sukey's Choice quilt block, trim all four to 2-1/2"x2-1/2". 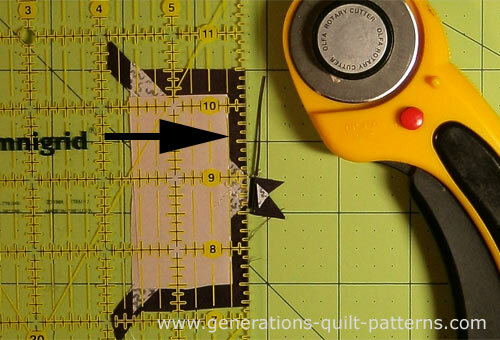 Return to your normal piecing stitch length. Install your quarter inch foot. Arrange the units into rows. For the Aunt Sukey's Choice quilt block the geese all point out. Bottom corners are a mirror image to the top corners. Check to make sure all your Geese point out from the center. Stitch the rows together. Press, SA away from the FGUs. Stitch the rows together. After one final press, your Aunt Sukey's Choice is finished! Aunt Sukey doesn't get to have all fun!